The Northern Rivers region of the New South Wales Coast encompasses Byron Bay, Yamba, Ballina, Brunswick Heads, Evans Head, Iluka and Tweed Heads all the way down to Kingscliff. Along the way you can visit the huge extinct volcano of Mount Warning, the most Easterly point of Australia's mainland at the rich history of the Cape Byron Bay Lighthouse, the migrating wales off the coast of Ballina, the Ballina Naval and Maritime Museum, Victoria Park Nature Reserve, Iluka Nature Reserve and taste the iconic Yamba Prawns fresh from the sea to you. Port Stephens, Nelson Bay, Port Macquarie, Coffs Harbour and the Blue Mountains make up New South Wales' North Coast and the experiences and attractions here are as many and varied as the NSW Coast itself. Take a camel safari along the beach in Port Macquarie, swim with the dolphins at Port Stephens, marvel at the Dorrigo National Park, kayak on the Myall Lakes, watch the wales in Port Stephens, visiting the thundering Ellenborough Falls, stop for a photo and some fantastic food and educational tours at Coffs Harbour's Big Banana or fish at South West Rocks, famous for the wide range of species in the area. Ranging from Newcastle to Stockton, Lake Macquarie, Mereweather and Blacksmiths New South Wales' Hunter Coast is renowned for its rich history, picturesque scenery and fine wining and dining. Wine tasting tours are a popular way to spend the day while Newcastle offers a range of beaches and parks for surfing, fishing, swimming and recreation. The Singleton Coalmines are also a popular place to visit as is Historic Morpeth and the Maitland Gaol. Barrington Tops are best explored by 4WD while Lake Macquarie is most enjoyable with a sailing cruise. Don't forget to check out the Stockton Sand Dunes and maybe try sand boarding. 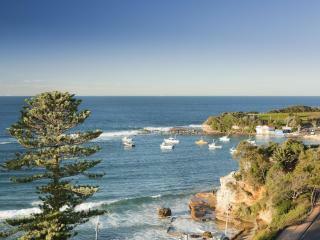 The New South Wales Central Coast is made up of Ettalong Beach, Terrigal Beach, Ocean Beach Umina and The Entrance. Along this stretch of coast you'll find a range of attractions including The Australian Reptile Park, stunning National Parks and Reserves at The Entrance, the Ken Duncan Australia Wide Gallery, Glenworth Valley Horse Riding, the iconic Hawkesbury River Ferries, Gosford Regional Gallery and the unique Terrigal Beach. 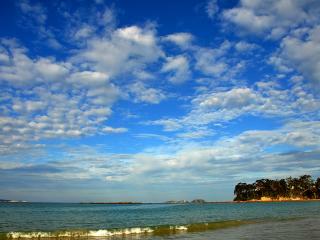 The harbour city is famous for its great beaches and each has its own character and attractions. Sydney beaches on the New South Wales Coast include Cronulla Beach, Bondi Beach, Manly Beach, Palm Beach and Coogee Beach. One of Australia's most famous beaches, Bondi Beach is renowned for its great surf and trendy coastal lifestyle. The Manly area and Manly Beach is a great place to enjoy the harbour and has 18 ocean beaches, coves and inlets to explore and enjoy. Cronulla Beach enjoys a reputation for its fun activities and many water sports including surfing and body boarding. The area is also home to a great range of pubs, clubs, restaurants, cafes and nightlife. 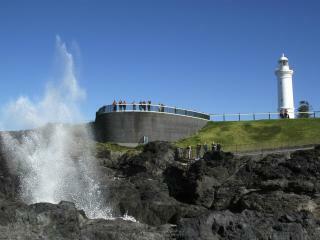 The Illawarra region of New South Wales' Coast includes Wollongong, Illawarra, Shellharbour and Kiama. Famous for its well-known body of water, Lake Illawarra is a hive of activity for water sports, fishing and prawning. You can hire a boat, sailboard or catamaran to explore the waters which are easily accessible from the 13 boat ramps that surround the lake. Cockatoo Run is the affectionate term for the Illawarra Scenic Mountain Railway and provides breathtaking views of the South Coast and Southern Highlands. Journeying acrpss the Georges River and through the Royal National Park this is a must see attraction. Batemans Bay, Narooma, Merimbula and Sapphire Coast, Bermagui, Ulladulla, Jervis Bay and Shoalhaven, Berry, Eden and Pebble Beach are all part of the New South Wales Coast South Coast. A picturesque region, there are plenty of enjoyable ways to spend the day and explore the area. Cruise Batemans Bay and enjoy the beautiful views, relax at Merimbula and visit the historic lighthouse, picnic at Eden with views at Lookout Point and Eden Wharf, or take part in a range of marine activities in Ulladulla including fishing, swimming, surfing, boating, snorkelling and the most popular one - eating at the many seafood restaurants.